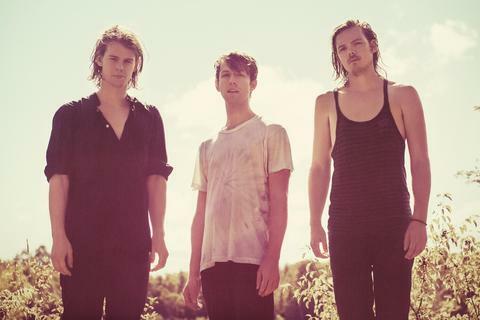 Half Moon Run is a talented young band from Ottawa, Ontario and Comox, British Columbia. It was in a practice studio situated in Montreal’s Mile-End district, through the hardships of time constraints and flat-lined bank accounts, that the trio bonded and created their unique sound, fusing together the restless elements of indie, pop and folk with beautiful rhythmic harmonies, delicate guitar lines and a hint of warm electronica. Armed with solid training and raw talent, they mix and combine their different musical backgrounds. Their complex arrangements, inspired by both classical and modern composers, are particularly striking to hear and see during their live shows. Devon Portielje’s remarkable voice is beautifully backed up by Connor Molander and Dylan Phillips. Phillips often plays drums and keys simultaneously as Molander and Portielje shuffle between guitar, keys, samplers, and percussion folky three-part harmonies hold down moody, psychedelic arrangements and electronic-infused soundscapes. On the heels of a 32-date in 32 days tour of Europe in May 2012, and 6 months after the Canadian release of their debut album DARK EYES, the international buzz hit fever pitch. Half Moon Run toured across North America with Metric and later with Patrick Watson in Canada, the U.K. and Europe, as well as playing festivals such as Iceland Airwaves and Inrocks Festival in Paris. By December, it was announced that the group had signed a deal with Glassnote Entertainment Group in the U.S. Glassnote will oversee the global release of DARK EYES in 2013. Half Moon Run recently confirmed that they will support Mumford & Sons across Europe this coming March and April 2013. Currently in Australia for a month-long tour, Half Moon Run will return to Canada for gigs throughout February and March before heading to Austin, Texas.